The usefulness of Stock-Flow Consistent (SFC) models is that they allow us to illustrate concepts in economics without relying solely on verbal descriptions. In this article, I will discuss my interpretation of some of the ideas floating around in Modern Monetary Theory (MMT). I will note that these are my interpretations of statements made by others, illustrated by an extremely simple model. The key is that even simple models can be used to clarify our thinking. This article is only a partial response to an article by Gerard MacDonell. He is unhappy about some of the writings of Professor Bill Mitchell, one of the leading MMT economists. I am not going to argue on Mitchell's behalf, rather I just want to offer some analysis that touches on some of the technical issues Gerard made. He noted that Federal taxation and spending are roughly similar, so how does that square with MMT pronouncements about the independence of taxation and spending? This outcome is not surprising, as it is exactly the sort of thing that is predicted by SFC models -- and MMT mathematical analysis of the economy uses SFC models. I will address these here in turn. Taxes are mainly imposed as a percentage of incomes (or activity, such as tariffs or sales taxes). There are some user fees that are fixed, but these are typically a small part of total revenue for the central government. Spending is set in dollar amounts, or dollar amounts based on rules. (For example, welfare recipients receive benefits based on some fixed scale). A tax rate, which is a flat percentage of household income. Note that we decided to ramp up spending purely based on feeling good (or bad) after some Stanley Cup playoff games; we did not care what the boring government debt nags have to say. We make no adjustments to our tax rates whatsoever to compensate for increased spending. Since this is a red-blooded Keynesian model, we see that increased government spending resulted in greater activity. The more we spend, the more the economy grows. Even though we adjusted spending without any reference to raising the tax rate, we still ended up with the same debt-to-GDP ratio. If one reads Monetary Economics, there is a long discussion of steady states, and this outcome is exactly the sort of thing we are supposed to expect. The steady state debt ratio is a function of the tax rate and private sector behaviour. The behaviour of the deficit is unusual when compared to real world behaviour: it reverts to zero. This is because this is a no-growth economy that heads to a steady state. If we are in a steady state, all stock variables when scaled by GDP are constant, which implies zero flows. Therefore, the net creation of government debt has to be zero. 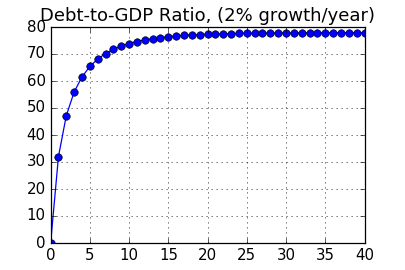 If the steady state featured a positive growth rate, we would revert to a deficit that allows debt levels to grow in line with nominal GDP, as seen below. Figure: Deficit for country growing at 2%/year. The chart above shows the result of a different scenario, where the economy grows at 2% per year in the "steady state." The country did not start out at steady state, so the deficit as a percentage of GDP starts out at a higher level, then declines towards a constant value. 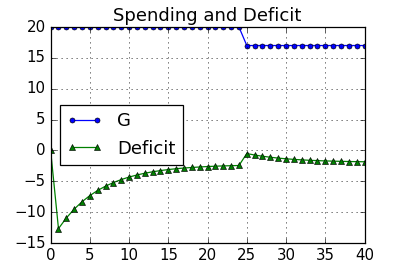 Figure: Government consumption (G) and the the deficit in the scenario. In this example, we are looking at a country that is facing ever-increasing debt. (The source of the problem is business sector hoarding, as described in this article.) The government was running continuous deficits, and some fiscal conservatives got elected. At time period 24, the government was running a deficit of (about) $2.44, and the government decided to cut spending by $3 in time period 25, so that the budget would go back to balance. This did not work. There was a temporary improvement in the budget balance, but it fell short of a surplus as a result of multiplier effects. 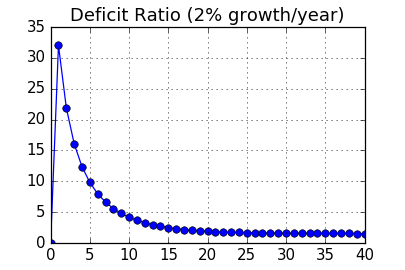 (Note that a larger cut back would result in a small surplus in time period 25, that is, a surplus is possible to achieve.) This is an example of a failure of "static" budget analysis -- cutting spending by $1 does not improve the realised deficit by $1, even if the so-called budget wonks say it will. Furthermore, the improvement was only partial; the budget deficit reverted back to a similar level of deficit in response to lower output. Examination of what was causing the deficits -- hoarding behaviour in the business sector -- tells us that any attempt to use fiscal policy to correct the budget deficit was doomed. Unless there was a policy to force the business sector to run down its financial asset holdings, the government budget would always return to deficit. In other words, the budget balance will reflect decisions made in the private sector, and the government only has an illusion of control over the deficit. In the real world, it only looks like budgets are under control during expansions because budget assumptions systematically underestimate growth, and hence tax revenues. ("The deficit is less than projected due to our brilliant management of the economy!" is a standard press release.) Furthermore, a great deal of cookie jar accounting is used by governments to make it look like they hit budget targets. When we look at the various stockpiles of financial assets that are building up in pension funds, tax havens, and on corporate balance sheets, we should be able to extend the logic of this example to see why we should not be surprise by "high" government debt levels. Once again, this example is highly simplified. If we added in various welfare state programs, the budget deficit moves further and further from the control of government. 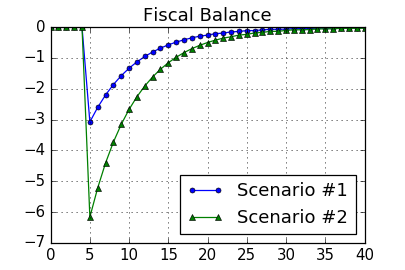 Even simple SFC models can be used to demonstrate that we cannot think of government budgets purely in dollar amounts under the control of the government. The code that generated these examples is on the GitHub repository. Unfortunately, the file names are only temporary placeholders, currently: intro_X_XX_sim_fiscal.py, intro_X_XX_sim_multiplier.py. They will be used in my user manual, and the "X"'s will be replaced with the chapter/section number. * This is due to have too large an error tolerance for terminating iterations. I guess I will set the parameter default to be less tolerant of errors. ** I am not using controllable in the technical sense used by control engineers, in case anyone is wondering. The thing about Gerard MacDonell's article is that his descriptions of what MMT says are largely true, at least in my understanding (and I can not pretend to have authorization to explain MMT). But this is kind of like criticizing an atheist by pointing out that they don't believe in God. The atheist says "that's true, but so what?" just like you point out that SFC models anticipate the result that Gerard points to. Btw, your response was much better than my earlier attempts. Since you are not attempting to argue on Bill Mitchell's behalf, I would like to try a bit. First off, I would say that MMT economists do not have a monopoly as far as being prickly academics when their ideas are challenged, and when they do seem that way I think they have more justification than most others. Second, Bill Mitchell seems less prone to act that way than many other economists anyway. It seems that I hold Mitchell in a similar respect to how Gerard MacDonell respects Krugman. Third, MMT commenters such as me can be rude and wrong when describing MMT, but that doesn't mean the ideas of MMT are crazy. Even if they seem so at first. 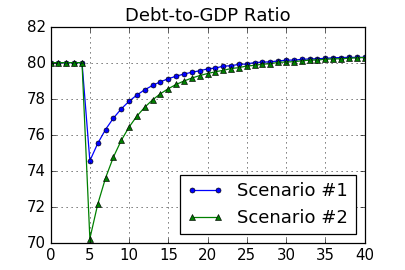 MMT seems very logical when compared with many of the assumptions used in standard macro. Gerard is ignoring that MMT is also known as neo-Chartalism, which can be summarised as: taxes drive the value of the currency. This obviously implies a need for taxation. There are some people who incorrectly interpret MMT as saying that taxes can be abolished. That is unfortunate, but what am I supposed to be about that? My feeling is that he needs to focus on a topic where MMT authors are saying something very concrete, and not worry about how they described MMT in a blog post five years ago. You have a guy who can't see that buying is different from spending, so he's hardly going to see that taxes are different from spending. This is the problem with sitting in the economic frame for too long - it dampens your sensitivity to alternative viewpoints. MMT uses an alternative viewpoint. It looks at the cycle from the other end, and unsurprisingly that leads to highlighting things that are quite well hidden when looked at from the 'economy fist, private sector first, raise funds first' frame. Government spending stops when they run out of things worth buying. That's the limiting factor - and also the political control factor. What shall government buy and how much should it pay for it. In that context taxation is just one of several tools for stopping the private sector using things and freeing it up for use by government. And it is a particularly bad tool because it is a carpet bombing approach. I don't know if you'r resolver has bank lending in it, but if you rerun the models where bank lending is restricted by category as Mosler suggests (loans can only be for capital development, including cars loans and credit cards, and house purchase at a sensible multiples). Getting rid of share buybacks, margin lending and all the other financial leverage tricks frees up a lot of purchase space by eliminating velocity in the finance sector. That, along with simply banning things like private medical and private schooling, frees up the resources government needs for the public good. And you don't need taxation - particularly if the 'deficit' and the 'debt' has a zero interest rate. I don't know Neil. Those financial leverage tricks you mention- how much do they add to demand for goods and services rather than demand for financial assets? Taxes are necessary, especially if policy makers accepted MMT and ran a full employment economy with a Job Guarantee like MMT advocates. At full employment, wouldn't taxes plus the private sector financial asset saving have to equal government spending to avoid inflation? "And you don't need taxation"
Let me clarify that before it gets misinterpreted. You don't necessarily need increased taxation. You need targeted taxation that frees up the correct resources. I would agree that fiscal policy needs to be modelled with endogenous deficit / debt levels and that this is an important distinction from mainstream models that simply treat the debt level as a policy tool. However it is worth noting that, in reality, debt levels do influence fiscal policy and it is not unusual in applied SFC models to have outstanding debt as a factor used in determining government expenditure, for example. But there is a big difference between trying to control the debt level and actually being able to set it. Sure, politicians sometimes worry about debt levels, and so it can affect behaviour. I am giving an oversimplified example of what happens if we just leave things on autopilot. 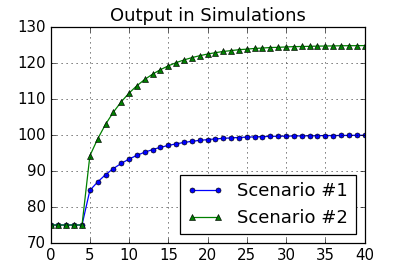 Steady state - it was an error tolerance issue. I guess I need to tighten up my default parameter choice for the error tolerance. Gerard M. asks a question: Does intro-style MMT accept that there has to be a correspondence between expenditure and taxation over the longer haul? Bill Mitchel says: MMT is what is, not what might be. Brian says, in effect, regard what is: 1. taxes are set (via a political process) as percentages of income; 2. government spending is set (via a political process) in nominal amounts; and 3. governments using such political processes do not actually control the annual deficit or surplus. These are descriptions of WHAT IS. In Stabilizing an Unstable Economy Hyman Minsky thinks the government needs an ability to force a surplus under some conditions. I do not recall his exact rationale and thoughts although he seems to be more concerned about markets forcing the government to curb its deficit spending then authors in the Modern Monetary Theory group. In the system described as WHAT IS the consolidated government could expand balance sheets either by selling more bonds or by increasing the sum of currency in circulation and central bank reserves. Stella argues that federal bonds are the superior financial instrument in demand by markets since only banks can hold reserves, but both banks and nonbanks can hold government bonds, and paper currency earns no interest. I agree with Gerard that arguments from other contexts are irrelevant to convince people that Modern Monetary Theory expresses a more correct view of WHAT IS. I agree with Brian about spending and taxation via a political process renders the federal deficit/surplus into an autonomous factor that forces Treasury to issue or net redeem securities using control factors on the federal balance sheet. The MMT argument about eliminating bonds has one technical footnote: bills would exist, but their yield would be capped by statute (0.25%?). The private sector could buy as many TBills as they want, which is a way of getting "money" out of the banking system. As for Minsky, Randall Wray wrote a piece discussing the relationship between Minsky and MMT a few months ago. Not sure where it appeared at this point. Minsky was influential (Wray's supervisor), but not pure MMT. There is a link in the article to a talk given by Minsky in 1991. I have the 2008 publication of Stabilizing an Unstable Economy which was first published in 1986. Minsky explains his policy for stabilizing the US financial system in chapter 13: an agenda for reform. A section on page 336 is called the significance of a balanced budget. I am not sure whether Minsky or MMT have the superior insight concerning the institutional role of taxes. Minsky says taxes must be a sufficiently high percentage of GNP to swing the government from deficit into surplus whenever there is a surge of inflation. This would act as an automatic stabilizer in a system where policy includes a job guarantee and less government subsidy of investment such that the economy has a greater ratio of consumption to investment. Too much investment over too long a period of time tends to introduce conditions (financial fragility and overcapacity) that eventually trigger deflation. I agree with that insight although I am less sure about how to fight inflation considering the fact that government deficit plus aggressive credit expansion in private markets would drive inflation and this might be amplified with a job guarantee. The central bank would probably still need to be able to induce a wage reduction by raising interest rates. However the job guarantee would serve as a safety net and establish a price floor under wages in the economy.